Free Shipping Included! 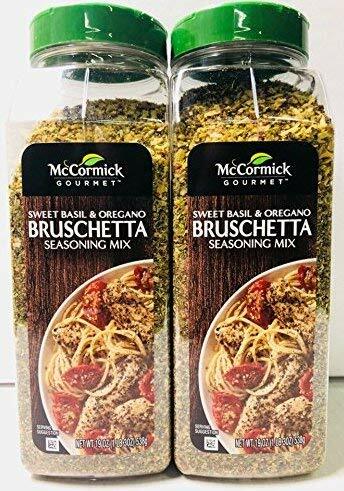 McCormick Gourmet Bruschetta Seasoning Mix, Sweet Basil & Oregano 19 Ounce (Pack of 2) by McCormick at The Flavour Stack. Hurry! Limited time offer. Offer valid only while supplies last. Ingredients Onion, Garlic, Sea Salt, Spices (Including Basil, Black Pepper, Oregano), Dehydrated Cane Syrup, Red Bell Pepper, Parmesan Cheese (Part Skim Milk, Cheese Cultures, Salt, Enzymes), Tomato, and Natural Flavor (Including Barley).